Historical Thursday Talk on the First Woman to Drive Across the U.S.
National Automobile Museum > About The Museum > News > News > National Automobile Museum Introduces Historical Thursday Talk on Alice Ramsey, the First Woman to Drive Across the U.S.
National Automobile Museum Introduces Historical Thursday Talk on Alice Ramsey, the First Woman to Drive Across the U.S. 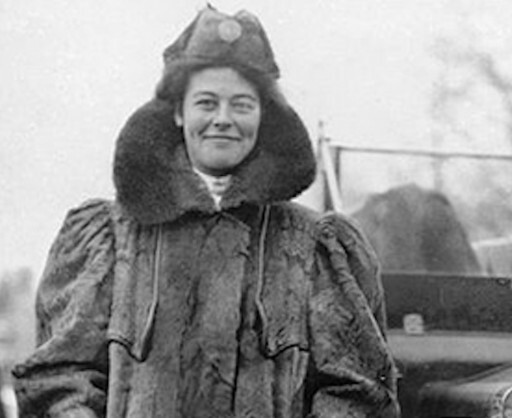 In celebration of National Women’s History Month, the National Automobile Museum has announced its Second Thursday Talk will feature a discussion on Alice Ramsey, the first woman to drive across the U.S. This is the third talk of this dynamic series which will be Thursday, March 8, 2018, 1:30-2:30 p.m., in the Museum’s Theatre. Enjoy a 30-minute talk, Q&A, refreshments and a unique piece of history. Cost: Free to Museum members. Included with paid admission. Otherwise, $5 per person to attend the talk. Jackie Frady is president and executive director of the National Automobile Museum. She has been labeled many things, including a “car guy.” However, she is most proud of being recognized for moving the “automobile museum industry forward as a leader, a professional, and as a woman who helped pave the way for other ladies — in an industry once driven by men,” as reported by KRNV News. Jackie is an honorary judge at the Pebble Beach and Hillsborough Concours d’Elegance and serves on the Honorary Board of the Ironstone Concours. In 2015, she was named a Top Ten Business Woman of the American Business Women’s Association. This national award is the highest honor given to a member for career accomplishments, community involvement, and contributions to ABWA. She has been actively involved with the National Association of Automobile Museums since its inception in 1994, and serves on the Board of Directors and has been president several times. She is also past president of the Nevada Museums Association. One of America’s Top 10 Automobile Museums, the National Automobile Museum showcases more than 200 remarkable automobiles. It features theatre presentations and audio tours in English and Spanish through 100,000 square feet of galleries, exhibits and vibrant street scenes and accompanying artifacts that bring displays to life. The museum is a dynamic and popular venue for special events as intimate as 60 and as large as 1,200 guests. For more information, visit www.automuseum.org. Mon. – Sat. : 9:30 a.m. – 5:30 p.m. Your ticket for the: National Automobile Museum Introduces Historical Thursday Talk on Alice Ramsey, the First Woman to Drive Across the U.S.